More recently, a few apps have appeared on the market that give us some decent alternatives to Photoshop with improved capabilities and ease of use. So with some promising options, I decided to take a look to see how well they work. I was looking for an application that stacks multiple light frames in order to reduce noise but I was pleased to find that apps now handle dark frames as well. Dark frames are captured after capturing the light frames using the same settings with the lens cap on - to capture hot pixel noise. I was also happy to see apps handling the separation of the foreground from the sky in order to produce results that include sharp details with reduced noise in the foreground as well as the sky. 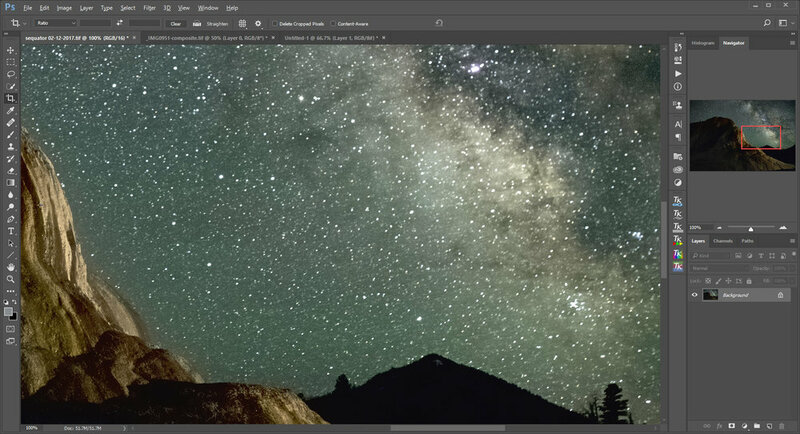 First on the scene was Starry Landscape Stacker which runs only on a mac and then more recently an app called Sequator appeared on the market for the pc only. I tested them both using a 10 image sequence captured at the Upper Terraces near Mammoth Hot Springs in Yellowstone National Park, Wyoming. By the way, I'm primarily a PC user so running Sequator was easy. Running Starry Landscape Stacker which runs only on a mac was a bit of a challenge so I rented a virtual mac desktop from virtualmacosx.com. It's not as good as owning my own Mac computer but this approach is cost effective and it served my needs well. This is where we load our light frames into the app. You can use as few as 2 light frames but I suggest no less than 4 with 9, 16 (ideal), or 25 being the number I recommend most. Starry Landscape Stacker accepts light frames, dark frames, one master frame, and one mask file. And in terms of file formats, it accepts 8-bit jpeg, 8-bit tiff, or 16-bit tiff with the 16-bit tiff being the best option as it provides the best image quality to the app for stacking. The app scans the images and adds a red dot on each star it finds. Our job is to remove the red dots that come from light spots below the horizon. I like to reduce the brightness and increase the contrast to make the red dots stand out more. Then we need to add red dots in the sky to make it easier for the app to create a mask. We do this by adding dots just above the horizon in a line that continues along the right side, along the top, and then back down the left side (as shown in the screenshot on the right side). Use the Z key to zoom in for the more detailed areas. After clicking the "Find Sky" button, the app creates a mask. We'll now need to review the mask to find any areas that need adjustments. We can paint on the mask with either the sky color (blue) or the ground color to make our adjustments. After clicking the "Align and Save" button, the app applies the mask to separate the ground and sky. It then combines the exposures of the sky and then it combines the exposures of the ground before blending them back together. This is where we save the final output image as an 16-bit tiff file. We also have the option of saving a file with a mask that potentially makes it easier to apply targeted adjustments in post-processing. I'm good at making my own masks so I don't use this option but some people may find it helpful. This is where we select our light frames - called Star Images in Sequator. As an additional option, we can select our dark frames in a separate step and in Sequator, they're called Noise Images. And finally if we like, we can also add our flat images - called Vignetting Images in Sequator. It's nice to see that Sequator can handle a wide variety of input files including jpg, tiff, and even raw files. For the Base Image, we'll want to select the light frame image that was captured in the middle of the sequence. This determines the tiff file we'll want to save as the final output image when processing is complete. Sequator can produce either an 8-bit jpeg or a 16-bit tiff. To get the best image quality possible, setting your output as a tiff is recommended. After clicking the "Start" button, the app will apply the settings and stack the images together. And with the "Ground Freeze" option selected, it will separate the ground from the sky in each image, stack all of the sky portions and then stack all of the ground portions before finally blending them back together again. It was good to see that noise was significantly reduced with both Starry Landscape Stacker and Sequator. It was also good to see how well both apps did with separating the ground from the sky, stacking, and then combining the stacked results of each back together again. Finally, it was great to see these apps handle far more than the 4 image limit that Photoshop can handle without having to handle the alignment manually. But looking with a critical eye, I found that Starry Landscape Stacker came out ahead in several areas. It should be noted that Starry Landscape Stacker produced a final image with the same resolution as the original light frames while Sequator produced an image with just half of the resolution as the original light frames. This decrease in overall resolution is the result of my having run Sequator with the "Merge Pixels" option enabled. This feature (which performs pixel binning) can be disabled to get the original size output if desired. To take this a step further, I'd say that Starry Landscape Stacker produces quality on par with what I typically get from stacking in Photoshop - which says a lot. And when we consider that Starry Landscape Stacker does a great job of blending the two together (which can be a bit of a challenge to do well in Photoshop), I have to say it produces better overall quality than Photoshop. But looking even further, the key differences that gives Starry Landscape Stacker the big edge include overall ease of use and the capability to stack more images. For me, I'm pretty excited to use Starry Landscape Stacker as my favorite stacking app.